Brush 4 1/2-cup capacity ovenproof ramekins with butter. Divide the breadcrumbs among the ramekins and rotate to coat the inside. Shake out excess. Melt the extra butter in a medium saucepan over medium heat. Stir in the flour until the mixture is smooth. Cook, stirring constantly, for 1 minute or until the mixture bubbles. Remove from heat. Gradually add the milk, stirring until smooth. Place the pan over medium heat. Bring to the boil, stirring constantly, for 1 minute or until the mixture thickens. Remove from heat and stir in the goat's cheese and chives. Transfer the goat's cheese mixture to a large heatproof bowl and set aside for 10 minutes to cool. Add the egg yolks and stir until well combined. Season with salt and pepper. Use an electric beater to whisk the egg whites in a clean, dry bowl until firm peaks form. Use a large metal spoon to fold half the egg whites into the goat's cheese mixture until well combined. Gently fold in the remaining egg whites until just combined. Spoon the mixture evenly among the prepared ramekins. Place the ramekins in a large baking dish. Add enough boiling water to the baking dish to reach halfway up the sides of the ramekins. Bake in oven for 25 minutes or until puffed and golden. To make the fig and hazelnut salad, combine the vinegar and olive oil in a small bowl. Season with salt and pepper. Combine the hazelnuts, fig and rocket in a bowl, then drizzle with the dressing. Gently toss until just combined. 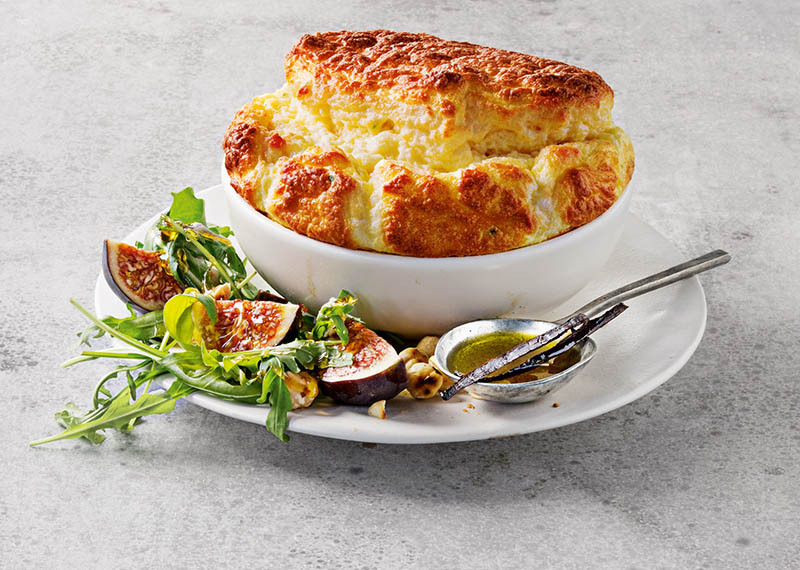 Arrange the souffles and salad on the serving dishes and serve immediately.